Several weeks ago, you received a “save the date” announcement for our upcoming conference, (Friday May 27-Saturday May 28), in which we will be discussing the papers that have been written by many of our members and friends, in anticipation of the Great and Holy Council. We would like at this time to provide you with a registration site, where you may see the pertinent information for the conference, register for it, and also (if you would like, and so long as there is availability), register to stay at St. Vladimir’s Seminary, for a very reasonable cost. 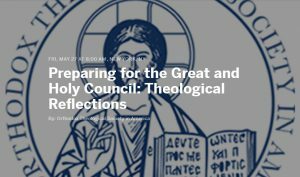 We will be providing shuttles between St. Vladimir’s and the venue for the conference, which will take place at THE INTERCHURCH CENTER (475 Riverside Drive, New York, NY 10115). We encourage you to click here soon to register for the conference, as well as for lodging (if desired). For your planning purposes, please note that the nominal registration cost does NOT include dinners or breakfast, but coffee breaks and lunch, while the conference is in progress. Please direct questions about the conference to the President at gayle.woloschak@gmail.com. If you are an OTSA member and have not yet paid your dues for 2016, please receive this friendly reminder to do so (and, if necessary, for 2015 and 2014). Many thanks to those who have renewed their membership! Dues are $30/year for active members and $15/yr. for retired or student members, and run from January-December of the respective year. You can pay via Paypal at otsamerica.org. (You must be logged into the site in order to do so. If you do not yet have an account, register on the site before proceeding to dues payment.) Click on the register tab to pay your dues. Alternatively, you can send a check to Teva Regule, treasurer, via postal mail. Please email her for the address (teva@mit.edu). If you have experience with websites, we are looking for someone who is able to take care of the OTSA site. If you are interested, please contact Edith Humphrey at ehumphrey@ptsedu. We look forward to an engaging and rewarding time of discussion at the end of May. May you have a blessed Holy Week and joyous Pascha!